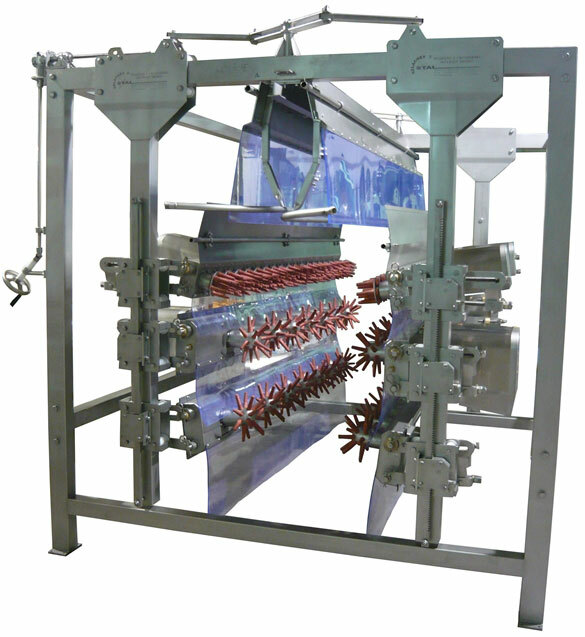 The SLB-I inline beam picker is designed for removing feathers from turkey stags and hen carcasses during the slaughtering process. The beam picker is a free-standing device, which does not need to be anchored to the floor. It is constructed mostly of stainless, acid-resistant materials. The basic elements of the picker are: frame with 4 pillars, 3 picking beams on each side – hung from the pillars symmetrically. Two upper beams on opposite sides are equipped with flat heads with rubber fingers. The remaining beams are equipped with three-dimensional heads. Horizontal adjustment of beam spacing is performed with the use of a system of levers and an electrically or manually operated worm gear. Vertical adjustment of beams, mounted to the pillars, is performed with the use of worm gears and a vertical toothed bar, which are also mounted to the pillars – there are 3 worm gears per each bar. Birds hanging in shackles are transported by the overhead conveyor between the rotating picking disks. Both the beam angle and distance between the rubber fingers and the birds being picked are adjustable.